This crane although not a scale model is closely based on an industrial crane I photographed in August 2006 on Granville island, Vancouver. 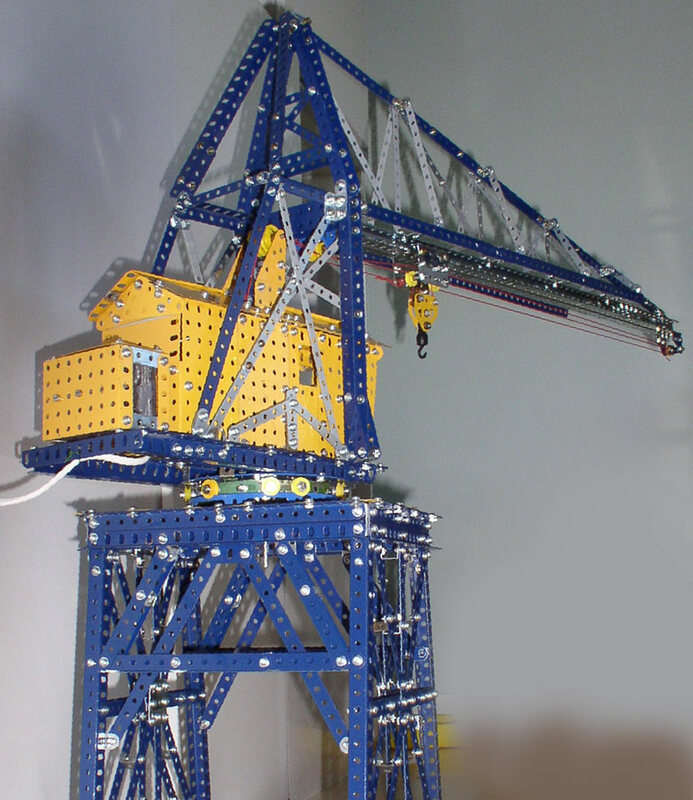 As soon as I saw this very unusual crane I thought it was a must for a Meccano model. 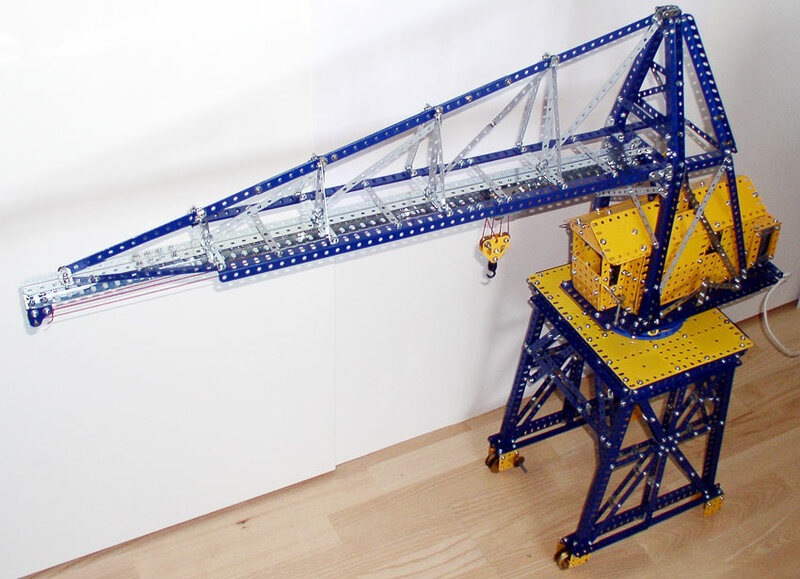 The model is built from1978 dark blue and yellow parts. The model needed a considerable amount of narrow strips these are replica modern grey or original Meccano zinc. Here I must confess to have gone into the area of non standard Meccano parts. The strips were were cut to the lengths I required from longer strips supplied by Jack Parsisson of Australia. I think the model looks like the sort of design that could have perhaps been in a Meccano manual and that was it's appeal when I decided to build it. I like the balance of colours in the parts. It has had to be a bit of a compromise in that the narrow strips are too wide as are some of the other sections compared to the prototype. 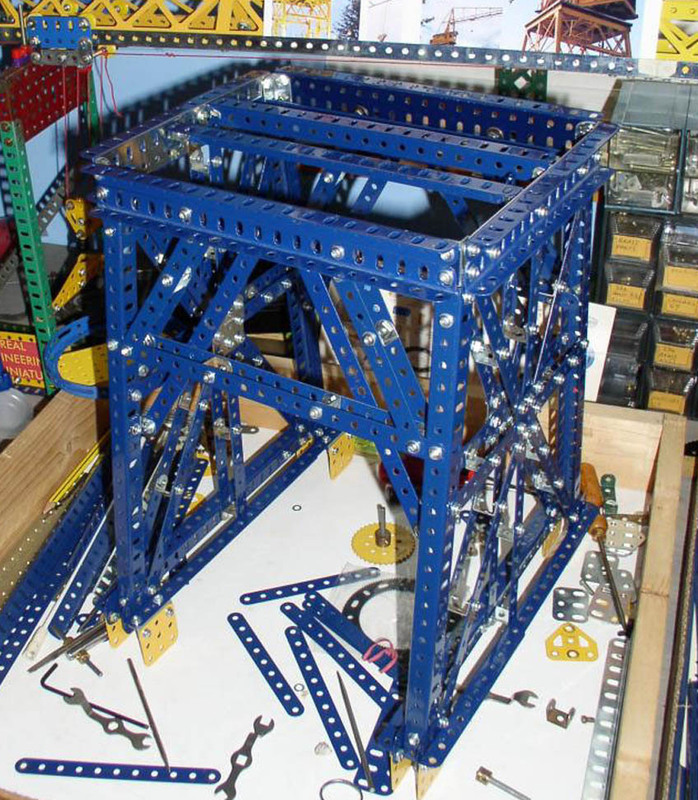 However as I said earlier it was not my aim to build an accurate scale model but a Meccano model based on this lovely, possibly unique old crane. A problem that needed to be solved was the balancing of the boom. Cranes of this type normally have a counter balancing boom with suspended weighs however on this crane the counter balancing is all on the crane base rear. Perhaps it was built on a tight budget? As you can see in the original picture of the crane (at the bottom of this page) a mass of heavy iron sits behind the shed like cabin. 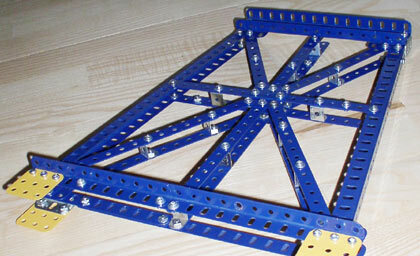 I have used about 75g of lead cast into a 5 x 5 hole Meccano module to counter balance the length of the boom. The original crane had, I believe a lifting capacity of around 4 tonnes. The functions slewing (rotation), hoist, trolley and travel are each carried out by separate electric motors. 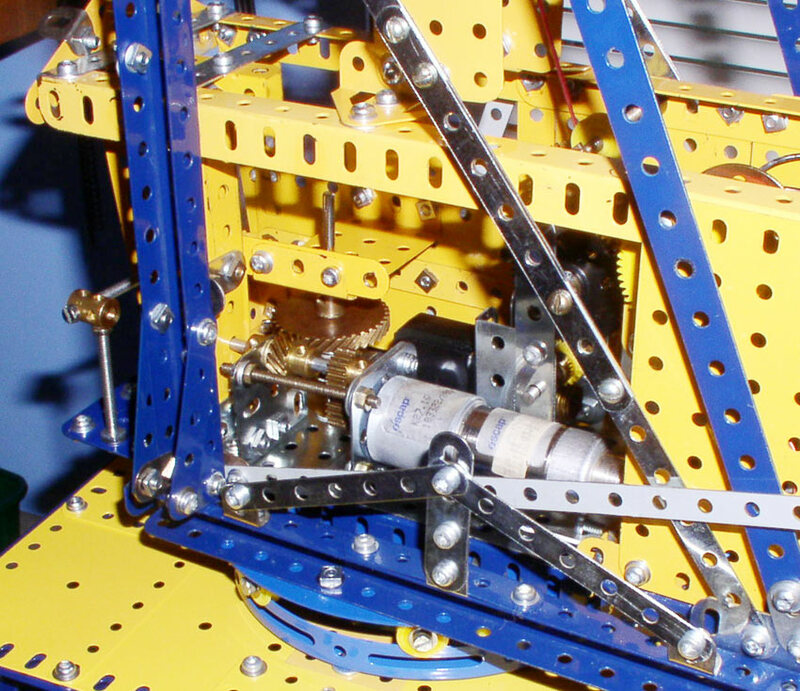 The trolley and hoist are driven by the small French, black motors supplied in many sets over the past few years. The Slewing is driven by a Swiss Escap geared motor . Picture above left shows one of the two side sections of the tower during construction. 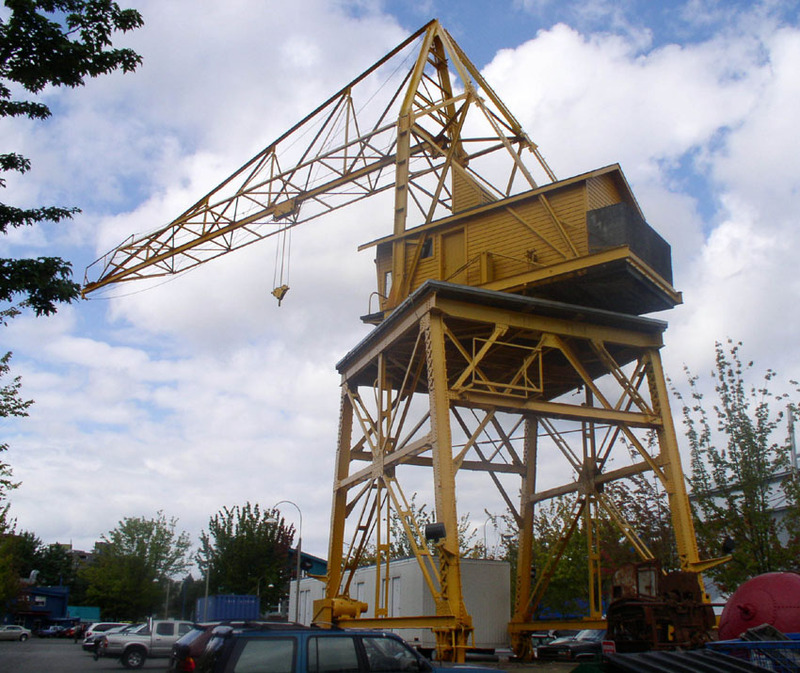 The original crane was built in the 1920s to serve the heavy industries that were once situated on Granville island. There were once two of these cranes used to load and unload barges but only one now survives and was restored around 2004. The crane is now firmly fixed to the ground and is no longer able to travel along the tracks. 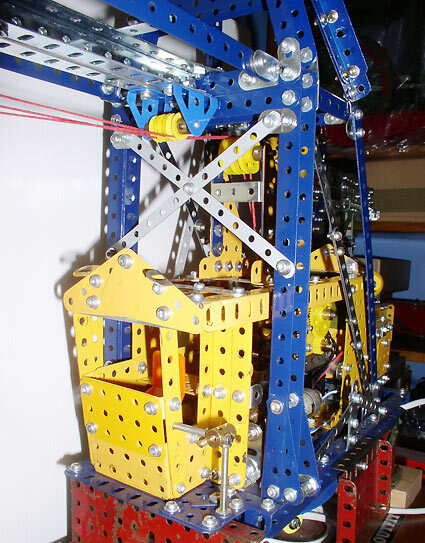 Picture above shows the tower on the work bench under construction. My picture of the original crane taken in 2006 is shown above.